UW Medicine researchers are leading a large, multicenter study to see whether joint-replacement surgery is better than fusion for patients with severe ankle arthritis. “More and more patients are coming in and asking for replacement surgery, but it’s not clear whether that’s the better choice,” said Dr. Bruce Sangeorzan, a UW Medicine orthopedic surgeon and UW professor of orthopaedics and sport medicine. He is the study's principal investigator. Arthritis is relatively uncommon in the ankle – much less frequent than hip or knee arthritis. In most cases, it stems from injury. “Unlike the hip and knee, which can wear out from routine use, the ankle usually doesn’t wear out without a cause,” Sangeorzan said. (Click to enlarge.) 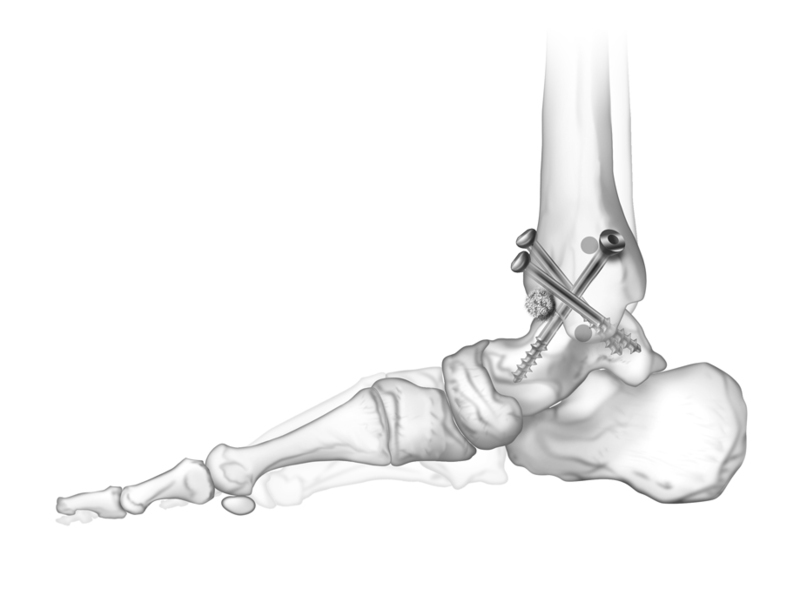 An x-ray shows joint-replacement hardware in the patient's right ankle. Until relatively recently, most patients have opted for fusion, in which the damaged joint tissue is removed and the bones are induced to grow together, or fuse. The fused ankle is fixed in place and cannot flex, but patients with good flexibility in the hip, knee and foot typically do well. “If you wear a shoe with a rubber sole, you can walk around and no one will notice that you have a fusion,” Sangeorzan said. In replacement surgery, the damaged ankle is removed and replaced with an artificial joint. Joint-replacement surgeries have had generally good results with the hip and knee, so when the first ankle-implant devices became available in the 1970s, many patients opted for that. But the ankle joint is more complex than the two others; the hip is basically a simple ball-and-socket joint, and the knee acts primarily as a rolling hinge. The ankle’s movements are more varied and, because the joint is smaller, it is subject to higher pressures. Early ankle-replacement procedures often led to complications that required repeat surgeries. Patient interest waned as word spread of the problems. Dr. Bruce Sangeorzan is a UW professor of orthopedics and sports medicine. picture of Dr. Bruce Sangeorzan, UW professor of orthopedics and sports medicine. Manufacturers say their newer designs, however, are much improved and patients are again asking for ankle replacement surgery. Yet data on comparative effectiveness is lacking. Sangeorzan and colleagues just completed a preliminary study funded by the U.S. Department of Veteran Affairs. It followed 300 patients who had either replacement or fusion procedures for three years after surgery. The results are not definitive, but suggest that patients who had replacement surgery – and particularly with the newer implant designs – reported higher physical functioning than those who underwent fusion. Nevertheless, patient satisfaction was similarly high in both groups: 92% of those with fusions and 95% of those with replacements reported being “satisfied” or “completely satisfied.” Pain-relief scores were a little better in the replacement group, though the difference was not statistically significant. The new study will have more patients, which should allow researchers to determine whether a real difference exists in outcomes, whether the implants hold up over time, and whether replacement surgery is better for some patients and fusion surgery better for others.